my take: Waaaaay back in my childhood, we watched the "Roots" mini-series on television...a riveting account of an African man enslaved and brought to America and how his family fared through the generations. Some of those images are seared into my memory. Homegoing is a similar experience. 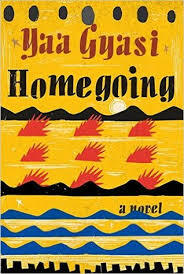 The novel opens in Africa to follow one family's generations in two daughters. Each chapter is another generation - sometimes giving a glimpse of the previous generation - just enough to let the reader know whose line is being followed. One line is soon shipped off to America and one line stays in Africa. And life. is. hard. everywhere. This is a timely read. With the Black Lives Matter movement and racial tension in the news, this is part of the back story of how Whites have treated Blacks for generations. An excellent walk-in-my-shoes literary work.